On Monday, Belgian media reported that Brussels investigating judge Michel Claise had opened an inquiry into whether Belgian banks, in particular Euroclear Bank, violated the UN freeze on Libyan assets. The recently emerged scandal around Belgian banks that have seemingly continued to pay interest and dividends on late Libyan leader Muammar Gaddafi’s government assets, which were ordered to be frozen in 2011, raises concerns that money could have since then been flowing into the hands of armed groups, including those sponsoring terrorism and human trafficking. Back in February 2011, the United Nations froze all foreign accounts belonging to Gaddafi's government. 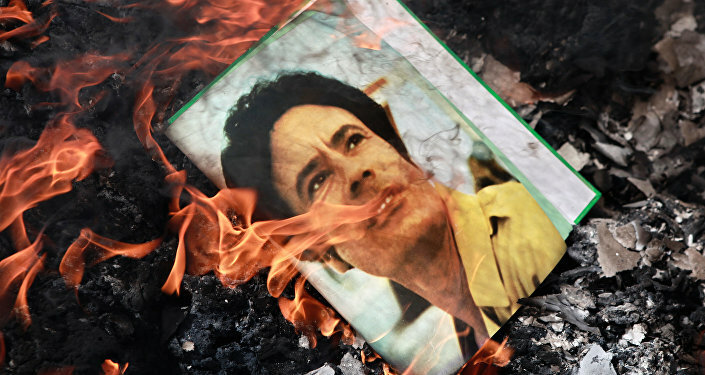 Gaddafi was overthrown and killed later that year, in October. About a month prior to Gaddafi's death, the UN Security Council partially softened its sanctions against Libya. On the basis of UN Security Council Resolution 2009, Working Party of Foreign Relations Counsellors (Relex) decided in November of that year that there were no longer any grounds for blocking interest payments on frozen bank accounts of Libyan authorities. Despite the freeze on the funds, they have continued to generate interests and dividends in the tens or even hundreds of millions. Since that, the interest and dividends were paid on accounts abroad, raising multiple questions where, by whom and in what hands the sums have landed, and whether there is actually a loophole in the sanctions system. Against the backdrop of the scandal in Belgium, which reportedly holds some 16 billion euros ($18 billion) worth of Gaddafi assets, the opposition, mainly the Greens, the Flemish nationalist VB party, Christian Democrats and Socialists, were quick to accuse former Finance Minister and incumbent Foreign Minister Didier Reynders of having discreetly given green light to the payment of the tens of millions of interests to banks in Luxembourg and the Gulf states. Georges Gilkinet of the Greens, a Belgian parliament member, noted that it was actually the Finance Ministry that authorized the payments in question carried out by Euroclear Bank. "The present Minister of Finance, Van Overtveldt (The New Flemish Alliance), and the former one, Didier Reynders (The Reformist Movement), who was in charge in 2011, refuse to say anything to parliament, though it is their duty to inform us. Why has the Ministry of Finance authorized, by a letter from the deputy head of the Treasury, the Euroclear Bank to release Libyan funds to Luxembourg and Bahrain among others?" Gilkinet told Sputnik. According to Gilkinet, both the Libyan deposits and dividends must remain under embargo, so that they could be transferred back, once the country stabilizes and creates a unified government. "These funds must remain under embargo, and in our opinion, also the interests on the sums invested, so that the money stolen by the Gaddafi family can be given back to the legal government of Libya, once the country is stabilized, pacified and has one democratic government in place. This is for the United Nations to manage," he stressed. Reynders, however, denied on Tuesday that he had been involved in the decision to unblock interest on deposits of the Libyan government, thereby redirecting all questions to his successor Steven Vanackere. Vanackere, in turn, cited the Working Party of Foreign Relations Counsellors of the European Union, which decided in November 2011 to allow interests to be paid. Filip Dewinter of the VP party expressed belief that that the issue of legality of unfrozen dividends on the Libyan deposits should be raised at both EU and UN levels. "Whether it is Didier Reynders or Steven Vanackere who gave the green light to the international payment of tens of millions, actually now hundreds of millions of euros [went to] to the [Libyan Investment Authority], the questions about the regularity and legality of the payment of interests of frozen funds should be put in front of the ‘expert group’ of the United Nations and the European Union that took that decision," Dewinter told Sputnik. Dewinter questioned the very right of the EU Working Party of Foreign Relations Counsellors to "interpret" UN resolutions, expressing serious concerns that the money from the deposits could have fallen into the hands of illegal groups involved in terrorism and arms trafficking. "Why on Earth have these European experts, Working Party of Foreign Relations Counsellors of the European Union, discussed and published an ‘interpretation’ of the second resolution established on November 20, 2011, stating that it was no longer possible to freeze the interest generated by the blocked accounts. What is this? Why has it become impossible to freeze hundreds of millions of interests, sent to the accounts of shady Libyan organizations controlled by warlords. Has that money now been used to buy weapons? Or to fund terrorism in Europe? Is that the European Union at work?" the politician wondered. He questioned the decision to unfreeze dividends without ensuring proper accountability, given that Libya was currently a failed state and one of the major countries of origin of migrants fleeing to Europe. "Clearly, the European parliament has to bring the question up to the plenary. It cannot be that such a group of ‘experts’ takes decisions in such an important matter as Libya, a failed state that lets depart every day thousands of illegal migrants to Europe, without following the proper political decision process!?" Dewinter argued. It is noteworthy that even the Belgian Royal Family has failed to avoid a scandal around the Libyan assets. Prince Laurent of Belgium, the younger brother of King Philippe and a champion of environmental issues, made an investment in Gaddafi’s Libya — a big project to stop the desertification of Africa. With his NGO Global Sustainable Development Trust (GSDT), the King's brother had pledged to plant a green belt to prevent Tripoli, Benghazi and Al Bayda in Libya from being silted up. As a result, 70 million euros ($79.5 million) contract was signed by the prince back in the times of the Gaddafi government, while 200 workers were supposed to work for 20 years on the project. The project failed even before Gaddafi’s demise. Since then, Prince Laurent has been trying to recover at least part of funds. In 2011, the Libyan state was ordered by the Brussels Court of First Instance to pay 17 million euros for unilateral breach of contract, plus 21 million euros in interest and court costs — a total of 38 million euros. The Libyan state’s appeal was dismissed. Since huge sums had been parked by Gaddafi in Brussels, the judge in charge of the case, Michel Claisse, found the equivalent of 16 billion euros at the Euroclear bank where the money was frozen: 5 billion euros in cash and another 11 billion euros in investment funds. But now, it appears that the interest and dividends produced by these "frozen" funds continued to be paid. In total, the interests reach about 3 billion euros ($3.4 billion). Asked about recipients, Euroclear has retreated behind its duty of confidentiality not to respond. Some 300 million euros ($341 million) worth of dividends were also found at HSBC in Luxembourg but the money was quickly transferred to banks in the Gulf states. To recover his due, the Prince is now seeking to address the Hong Kong-based HBSC bank. The police inquiry shows that interest goes to accounts belonging to the Libyan Investment Authority (LIA), the country’s sovereign fund, created in 2006. It is noteworthy that some of the strategic investments made by Gaddafi's governments and inner circle were indeed financially well advised. The LIA, for instance, purchased assets in companies, notably in Italy and the United Kingdom, that include Fiat, Juventus Football Club, UniCredit bank, the Royal Bank of Scotland, the former Finnmecanica engineering company (now known as Leonardo), the oil and gas giant ENI or the publisher Pearson. To answer who currently controls the LIA is very difficult, given the internal fighting in the post-Gaddafi Libya, with rival groups, some clearly dangerous Islamists, claiming control of the structure. Today, Libya is a failed state, permanently destabilized by Islamist militants and tribal militias. The UN-backed group is in the capital of Tripoli, while another, backed by the army, is in the eastern port of Tobruk. Both factions have their competing bosses to manage the sovereign fund. The UN sanctions on the billions of the LIA assets, invested with banks and fund managers across Europe and North America are still in place. In Europe, national governments are responsible for enforcing these sanctions. But the 28 EU governments held a meeting in October 2011 that interpreted the sanctions as being applicable only to the original frozen assets, not the interest earned after September 2011. The interest flows from the fund’s assets around the world are frequent and large. According to media reports, the LIA fund received about 600 million euros between April 2012 and April 2013, as interest from the combined, supposedly frozen, assets around the world. It is only to be hoped that this wealth will soon be available for Libya, once the war-shattered country stabilizes.